Good morning from cold Hamburg and welcome to our Daily FX Report. Today the European Commission will recommend in a report that finance ministers endorse Greece’s plan to reduce the nation’s budget deficit. However, we’re curious how the FOREX market will react. After the EUR/GBP recovered during the last two days from a multi-month low it opened lower today amid concern fiscal deficits in Europe will worsen. Roubini Global Economics wrote in the Financial Times that Greece needs an “austerity plan” backed by the International Monetary Fund. Greece’s Prime Minister’s three-year roadmap outlined last month includes steps to cut spending and raise revenue by 10 billion EUR this year. The GBP increased versus the USD after a U.K. report showed that the consumer confidence improved three points to 73 in January from a month earlier. The CAD, commodity linked currency, rose against the USD for the second consecutive day as equities and crude oil increased. The USD/CAD closed at 1.0570 yesterday after its opening at 1.0707 on Monday. The NZD/USD declined on speculation a report may show tomorrow that the nation’s jobless rate climbed last quarter to 6.8 percent, the highest level since 1999. Australia’s trade deficit widened in December as imports of goods including gasoline surged the most in almost two years, adding to evidence of an economic rebound. The USD/CHF has been trading in a bullish market since the end of November. As you can see in the picture the currency pair is drawing a so called flag-formation. 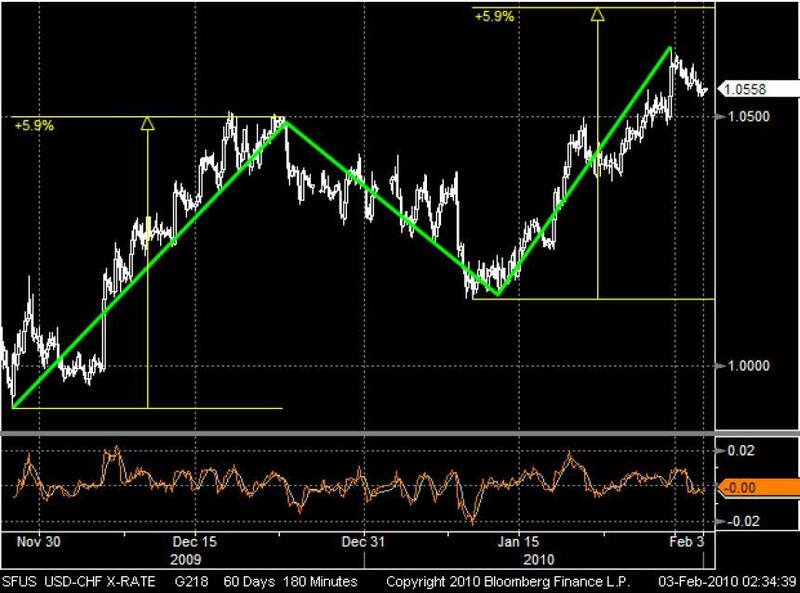 If we emanate from the formation the USD may raise in the third formation-part up to 5.9 percent as in part one, near to 1.0730. But it remains to be seen if the formation will extend or if the youngest rebound will boost and disrupt the formation. The EUR/PLN has been trading close to a bearish trend-line since the end of the last year, except the last week. 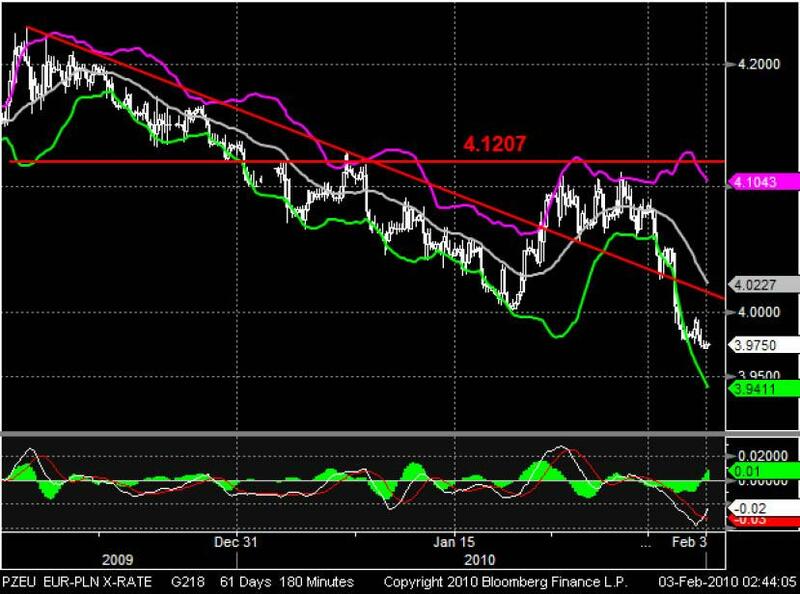 After the EUR climbed near to its resistance at 4.1207 the Bollinger Bands contracted like a bottle neck and initiated a bearish countermovement. In order to this, the currency pair fell below the trend-line again. At this level the MA Oscillator indicates a slight recovery.